I'm on a roll. I must say this new development of dispensing financial information through the use of short stories is making me excited about blogging on personal finance again. It keeps me thinking of imaginary characters making imaginary conversations. Actually they are not so imaginary. It's always based on fragments on some real aspects of my life, or on the life of others around me. If you will, it's more like my own brand of mixing facts and fiction together. Fun stuff. “Eh dear, come take a look at this!”, he said after putting down the cup of SOBE fresh soya milk (original). He would have much preferred the less sweet Trim version, but alas, the supermarkets are out of stock. It’s not a very good time to talk to her. She’s rushing off to work and as usual, there’s a lot of last minute things to pack for the journey. It doesn’t help that it’s cold and drizzling outside. The brightness of his voice doesn’t seem to dissipate the gloomy greyness outside. Sparing a precious few seconds of her time, she came over to where his fingers are pointing. She saw an advertisement in the Straits times with a mish mash of words. In the 2 seconds she needed to scan through the entire full page ad, a few words stand out amongst the rest. 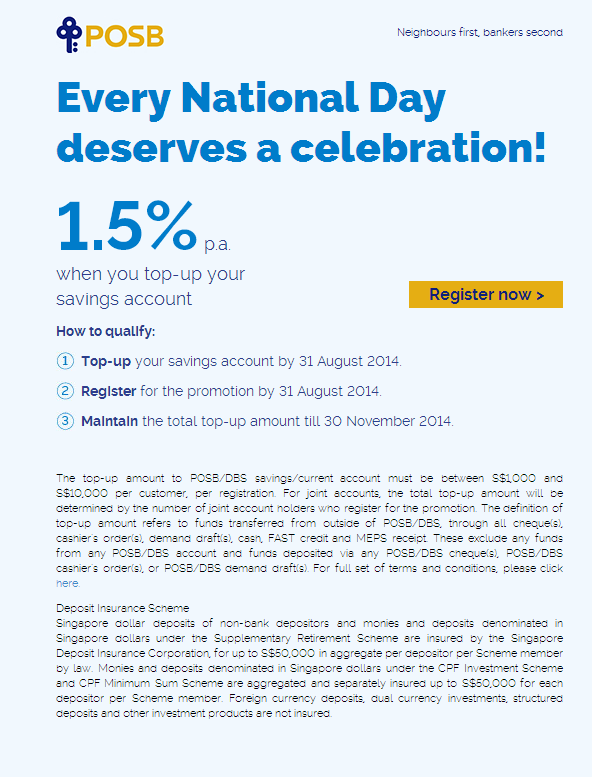 She first saw a “POSB”, then a “National Day”, something about a “celebration” and some short string of numbers (“1.5”). “What’s this?”, she said with a slight hint of impatience. She furrowed her brows before disappearing into the dressing room. From the living room, he can hear the sound of things being unpacked and packed. “Oh, they are giving out special interest if you top up your POSB bank account this month…erm, up to 10k only, at 1.5% per year”, he explained. “10k? I have 10k in my account. They do it automatically ah?”, she said it proudly before disappearing into another room. But Her Majesty needs to go off now. Her subjects need to wait for an audience, perhaps later in the evening during dinner time when things are a bit less hurried. Till then, a kiss and a quick goodbye and her Majesty is off for work. “If I put in 10k, I’ll get 37.40 as interest. Okay lah, I better do it before 31st Aug then. Still need to register online after topping up the fresh funds”, he said to his cup of SOBE fresh soya milk (original). He would have much preferred the Trim version though, but it’s out of stock, so it would have to do. Just like how he would have preferred his 10k to earn higher interest, this 1.5% per year for 3 months would have to do. Register here and read the full terms and conditions here. Have you grabbed POSB's low hanging fruits?